Gregory Rudzik is making a habit out of winning prestigious events across Ontario as he followed up last year’s Autumn Colours Classic triumph with a win on Saturday at Sunset Speedway’s Velocity 250. The Eastern Ontario Legends Series action didn’t start off smoothly, with Mike Westwood making significant contact with the turn two wall on Lap 2 of the first heat. Gregory Rudzik picked up the win ahead of Andre Fiorini, Parker Traves, Matt Haufe, Wes Cuthbertson, Robin Jongen, Don Arnott, Cory Richardson, and Howard Bentley. The second heat featured a quick caution when Paul Pierik spun in turn one on the opening lap. Keith McLeod picked up the win ahead of Terry McCelland, Shane Pollock, Bryan Batty, Mark Griffin, Kenny McNicol Jr., Rick Eades, Ray Janisse, Joe Sherman, and Pierik. The third heat featured a pair of cautions, as Massey spun in turn two on Lap 2, while Adam D’Agostino lost a wheel on Lap 9. Adam Cuthbertson picked up the win ahead of Kevin Foisy, Joe Adams, Josh Indig, Dawson Drimmie, Massey, Hyden Brown, Jeff Forsey, Ron Gibbons, and D’Agostino. Matt Haufe won the fourth heat ahead of Fiorini, Jongen, Wes Cuthbertson, Rudzik, Traves, Richardson, Arnott, and Bentley. Kenny McNicol won the fifth heat ahead of Pierik, Griffin, McCelland, Eades, Janisse, Pollock, and Sherman. The sixth heat featured a quick yellow flag with Drimmie spinning in turn two. Kevin Foisy picked up the win ahead of Adams, Adam Cuthbertson, Indig, Massey, Drimmie, Brown, Forsey, and Gibbons. The b-main featured a pair of incidents with Pollock spinning on Lap 3, and Richardson spinning in turn two on Lap 11. Dawson Drimmie picked up the win ahead of Perik, Massey, Eades, Brown, Janisse, Pollock, Arnott, Richardson, Sherman, Forsey, and Gibbons. 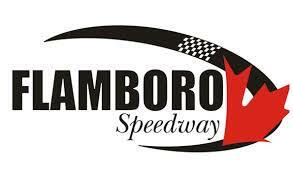 Come feature time, Kevin Foisy started pole ahead of Adam Cuthbertson, Matt Haufe, Joe Adams, Terry McCelland, Andre Fiorini, Gregory Rudzik, Keith McLeod, Kenny McNicol, Mark Griffin, Josh Indig, Parker Traves, Robin Jongen, Wes Cuthbertson, Bryan Batty, Dawson Drimmie, Paul Perik, and Andrew Massey. Foisy would grab the early advantage off the drop of the green flag with Adam Cuthbertson and Haufe side-by-side for second. Haufe would take the spot on Lap 2 ahead of Cuthbertson, Adams, and McCelland. It wouldn’t take long for the drama to start, though, as the red flag came out on Lap 6 for Drimmie making significant contact with the turn three wall. Thankfully, he was okay and able to walk away. The restart would see the second yellow flag wave as Batty went for a spin in turn two. The second attempt was smoother with Foisy leading as Cuthbertson and Haufe battled for second. Haufe won out once again, holding onto second ahead of Cuthbertson, Adams and Rudzik as McCelland and McNicol battled for sixth, with Fiorini and Traves side-by-side for eighth. There’d be battles all around the speedway, as Rudzik would get alongside Adams for fourth on Lap 10. The third caution came out a lap later, though, as Haufe and Foisy made contact in turn two for the lead, sending both drivers around. With 15 laps to go, Adam Cuthbertson now led ahead of Adams, Rudzik, McCelland, McNicol, Fiorini, Traves, McLeod, Wesley Cuthbertson, Indig, Jongen, Perik, Massey, Pollock, Brown, Arnott, Eades, Batty, Janisse, Griffin, Forsey, Bentley, Foisy, Haufe, Sherman, and Gibbons. The restart would result in the fourth yellow flag as Brown would go around. The second attempt was clean with Adam Cuthbertson leading ahead of Rudzik and Adams, as McNicol battled Traves for fourth, with McCelland and Wes Cuthbertson side-by-side for sixth. Behind them, Fiorini and Jongen were side-by-side for eighth ahead of McLeod, Indig, and Perik. Haufe had also began his climb from the back, moving into 13th on Lap 14 ahead of Foisy and Massey. The fifth caution came out that lap as Brown went around for a second time. Adam Cuthbertson got a good restart ahead of Rudzik and Adams, with the battle for fourth now between Wes Cuthbertson and Traves, as McNicol battled Jongen for sixth. Rudzik would get alongside Adam for the lead on Lap 16, taking the top spot one lap later. Adams continued to run third as the battle for fourth continued, with Fiorini now alongside Jongen for sixth. Behind them, McLeod ran eighth as McNicol battled Haufe for ninth. Wes would take the fourth spot on Lap 20 ahead of Traves, with Fiorini moving into sixth a lap later ahead of Jongen, McLeod, Haufe, Foisy, and Indig. Gregory Ruzik scored the victory ahead of Adam Cuthbertson, Joe Adams, Wes Cuthbertson, Parker Traves, Robin Jongen, Andre Fiorini, Keith McLeod, Matt Haufe, and Kevin Foisy. Josh Indig finished 11th, followed by Kenny McNicol, Terry McCelland, Paul Perik, Bryan Batty, Andrew Massey, Rya Janisse, Rick Eades, Mark Griffin, Don Arnott, Shane Pollock, Howard Bentley, Ron Gibbons, Joe Sherman, Hyden Brown, Jeff Forsey, Cory Richardson, and Dawson Drimmie.